Probably this programmer cable can be found on every AVR fan website. It is straightforward and easy to build. You need a few passive components that can be packed inside LPT connector. From my perspective, I wouldn’t recommend using this one programmer if you are more serious in microcontroller projects, because it has poor computer port protection. It connects directly to LPT port without precautions. 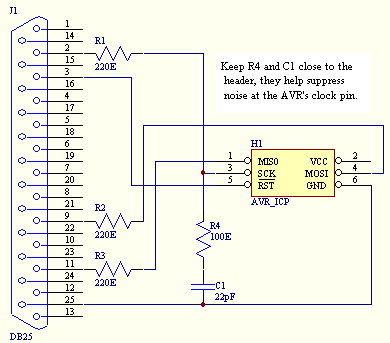 I recommend using a similar ISP circuit with buffer IC between LPT and target board. But let’s don’t pretend like we are brilliant. The whole beauty is in its simplicity. This thing does its job perfectly as long as the target board power supply is OK.
AVR ICP, AVR ISP. Bookmark.